Powers of Ten is a really cool Java app (basically a timed slide show) that shows successive images from the Milky Way down to the subatomic level. Lots of cool images on this site, including microscopic pictures of beer. Another related website I need to check out: Powers of Ten. I read in this morning’s paper that the wind tunnels at NASA/Ames Research Center in Mountain View are closing. These have been such a fixture here in the valley that most people have probably forgotten that they’re here. I remember going there for a school field trip a long time ago. The wind tunnels have their own home page on Nasa.gov. I was hoping to see some interesting pictures to link to, but unlike most Nasa web sites, this one doesn’t have any good ones. Nearby, Hanger One at Moffett Field may be demolished due to the amount of toxics on the site. Hopefully this is just a warning and they’ll be able to clean up the site without demolishing the building. Hangar One remains one of the largest “non-supported” structures today, according to information kept by the Moffett Museum. It’s outsized by only a handful of other hangars in the world, Henderson said, standing 1,138 feet long, 308 feet wide, and 211 feet tall at its highest point. It’s so big, Henderson said, nearly three Titanic cruise ships could fit in its deep hollow. Updated 2003-12-11 with new URL for Balloon 1.0 project report. The full article is a great summary — launched in March 1972, it’s official mission ended 25 years later in March 1997, but NASA and JPL have continued to receive signals from it. FLORIDA TODAY: STS-107 Columbia landing journal gives regular updates during the shuttle landing, including this unsettling entry: 9:20 a.m. EST, Feb. 1, 2003: NASA has lost communication with the orbiter and has no tracking data. NASA Space Shuttle Launches gives the complete list of all shuttle missions. 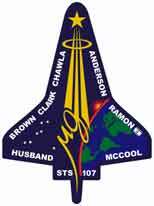 If I’m reading it correctly, STS-107 was the 113th shuttle mission. Columbia (OV-102) was the first shuttle ever built and participated in flight STS-1 on 4/12/81.